Space exploration has long been a source of fascination and wonderment to me. I grew up reading the classic science fiction novels of the mid-20th century, many of which idealised the notion of space travel. I also grew up watching the various Star Trek TV series of the 1990s, which seemed to embody a positive and progressive vision of humanity’s future in space. Our best hopes for the future, it seemed to me at the time, lay in exploring space. Space would provide a near-infinite arena in which to discover new truths and expand the possibilities of being. And yet, when I turned to academic life, I found very few philosophers willing to seriously debate the merits of space exploration. This struck me as odd given how prominent the idea was in popular culture. If philosophers engaged with technology at all, it tended to be in the fields of biology, warfare and the internet. All worthy inquiries, to be sure, but why the lack of interest in space? I had to turn to scientists and science fiction writers for that, but they would often ignore or develop superficial analyses of the philosophical questions — the questions about meaning and value — that interested me. Fortunately, this great silence is coming to an end. 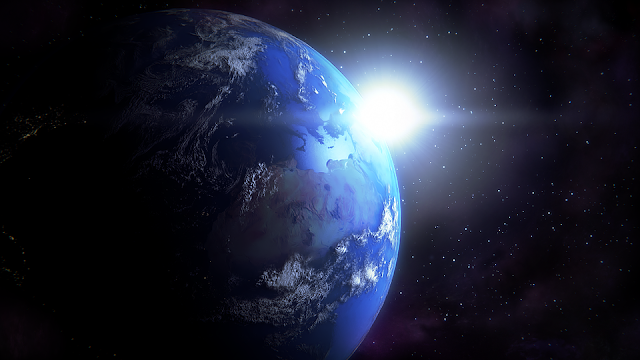 There has been a noticeable uptick in writings about ‘space ethics’ in the past few years. Philosophers like James Schwartz and Tony Milligan are doing some stellar work (sorry!) on this topic. Schwartz, for example, has written an interesting moral defence of space exploration. Indeed, he has gone even further and argued that not only is it morally permissible for us to explore space, it may actually be morally obligatory for us to do so. I want to analyse Schwartz’s argument over the next two posts. I start, by looking at the positive case: the reasons for thinking that we have an obligation to explore space. I follow this up in the next post by looking at the objections to this positive case. Space Exploration: The use of manned or unmanned spacecraft (and other technologies) to explore our solar system (including its planets and asteroids) and beyond. ‘Exploration’, here, is not limited to simply observing and recording details about the outer space environment, but also includes using resources from that environment, intervening in the natural environment on other planets and space bodies, and potentially settling (or ‘colonising’) those environments. This might seem like a long-winded definition, but I think it is important to be clear on each of its elements. In particular, it is worth emphasising the fact it covers both manned and unmanned space exploration, and includes exploiting and otherwise manipulating the outer space environment. Motivating moral principle: We have an ethical duty to ensure the survival of the human species, and to protect the environment that we inhabit here on Earth. For many people, this principle will be uncontroversial. I suspect that if you asked most people whether we have a duty to ensure our own survival and the survival of the ecosystems we inhabit, they would probably agree that we do (at the very least they would agree to the former if not the latter). Philosophers, however, may be inclined to disagree, arguing that we don’t necessarily owe a duty to an abstract class like ‘the human species’ and others arguing that there is nothing intrinsically valuable about the non-human environment. There are significant debates here about how we conceive and understand value and duty. We’ll have to set most of those to the side for now and work with the moral principle as set out above. Nevertheless, rest assured that Schwartz does entertain some criticisms of the motivating moral principle. We’ll get to some in due course. 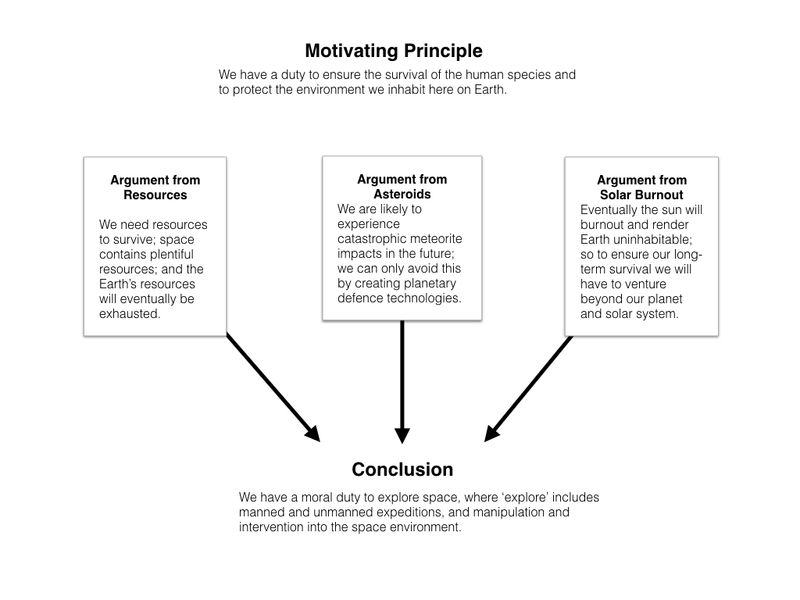 The Argument from Resources: We have an ethical duty to explore space in order to gain access to valuable resources. The Argument from Asteroids: We have an ethical duty to explore space in order to protect the Earth from existentially threatening asteroid impacts. The Argument from Solar Burnout: We have an ethical duty to explore space in order to ensure our survival beyond solar burnout. Let’s look at each of these arguments in more detail. (1) There are plentiful resources in space (on asteroids, comets, planets etc.). (2) We need basic resources to survive and we will eventually exhaust the resources available to us here on Earth. (3) Therefore, we will need to acquire resources from space in order to ensure our long-term survival. (4) We are obligated to do what is necessary to ensure our long-term survival and to protect our environment. (5) Therefore, we are obligated to explore outer space in order to acquire necessary resources from it. There are two potentially controversial premises in this argument. 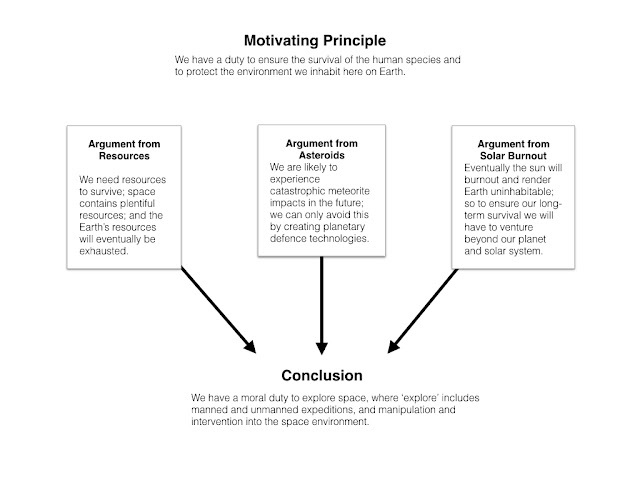 Premise (1) is potentially controversial because even if it is true that there are plentiful resources in space, they may not be the kinds of resources we need to survive. What do we know about the resource makeup of space that would justify this view? Schwartz notes that breathable air and drinkable water are probably the two most important resources for human survival. We know that water exists elsewhere in our solar system (and on asteroids and comets) and can be extracted from these bodies with more or less difficulty. Breathable air is, however, in short supply, though it may be abundant beyond our solar system. There are, nevertheless, other resources, particularly metals, available on asteroids and other planets. These are essential for various industrial processes and exist in such abundance that they could satisfy human needs in this regard for a long time. So while we may not find every resource we need in space, we can certainly find resources that are valuable. Premise (2) is probably the more controversial premise. It seems to suggest that we will, inevitably, exhaust the resources available here on Earth. This is something that environmentalists and conservationists could reject. They might agree that we will exhaust the resources if we continue as we are currently doing, but if we could reduce the human population, and switch to more sustainable and environmentally renewable modes of production, we could preserve the resource base indefinitely. Schwartz concedes this possibility but offers three responses to it. First, he thinks that certain strategies for conservation could prove depressing and less than ideal. For instance, depopulating the earth by (voluntarily) reducing fertility could be depressing since procreation is such a deeply embedded need for so many people. Second, he thinks that even if we could conserve the Earth’s resources, this is a risky process and we should probably have a back-up plan in case it fails. Acquiring resources from space would be an obvious back-up plan. Third, he says that even if you ultimately accept the conservationist view, you don’t defeat the case for space exploration because there are other arguments to contend with. (6) It is very likely that at sometime in the future a catastrophic event such as an asteroid (meteorite) impact will render Earth’s biosphere uninhabitable. (7) Therefore, we are obligated to prevent catastrophic events such as meteorite impacts. (8) Developing planetary defence technologies is the only way to meet this obligation. (9) Therefore, we are obligated to develop planetary defence technologies. This argument is more philosophically interesting than the previous one. We can take it for granted that premise (6) is true. We have ample evidence from the past to suggest that such catastrophic impacts can occur and that these have radically altered the Earth’s biosphere. While they may not completely wipe out all forms of life, they have certainly been destructive and if we want to ensure our survival we would be best advised to avoid them. Weak Preservationism: We have an obligation to (roughly) maintain current levels of bio-diversity, but not all existing forms of life nor all existing habitats. Strong Preservationism: We have an obligation to protect all (or most) currently existing species in their current environments. Weak preservationism does not generate an obligation to create planetary defence technologies. If we have no specific obligation to protect the Earth’s species and habitats as currently constituted, we could discharge our preservationist obligation by creating ‘space-arks’ or off-world colonies/settlements. This still results in a obligation to explore outer space and so would still support Schwartz’s overall case. Nevertheless, it’s only if we embrace strong preservationism that we are obliged to create planetary defence technologies. This however raises its own questions. Why embrace the strong preservationist view? Is there something intrinsically valuable about the current set of species and habitats that warrants their preservation? Schwartz looks at an argument from Holmes Rolston III that call this into doubt. Rolston observes, reasonably enough, that there have been many extinction events in the history of the Earth. The last great extinction occurred at the end of the Cretaceous period and resulted in the end of the dinosaurs. This extinction is thought to have been precipitated by a meteorite impact. But there is a paradox here. In a very real sense, we owe our existence to that impact. If it did not happen, dinosaurs could still be the dominant species. It was only through their extinction that our small rodent-like ancestors gained the ascendancy, and evolved into the many diverse forms we see on Earth today. There is, consequently, a ‘creative potential’ embedded in destructive events like meteorite impacts. This creative potential could be viewed as, on balance, a good thing: it’s good to have some evolutionary change and dynamism rather than stasis and preservation. So maybe we shouldn’t be looking to protect ourselves from catastrophic events like meteorite impacts? Schwartz again offers three responses. First, he argues that we could accept the value of ‘creative potential’ in nature without accepting the need to permit catastrophic events. There may be other ways to preserve that creative potential. Indeed, human beings could, through genetic engineering, be a major new source of creative potential (Schwartz doesn’t say this but it occurred to me as I read his argument). Second, there is a danger in Rolston’s strategy since there is no guarantee that catastrophic events like meteor impacts always lead to future creativity. If the impact was of sufficient magnitude it might wipe out all creative potential on Earth. Prudence would, again, seem to militate against this approach. Finally, a basic concern for current sentient life, and an awareness of the danger of instrumentalising that life (i.e. treating it as a means to some other potential, but not fully specified, good) would tip the balance in favour of planetary defence. (10) Living organisms from Earth require habitable environments in order to survive. (11) Therefore we have an obligation to ensure that Earthlings have access to permanent habitable environments. (12) One day, the sun will burn out and render the Earth uninhabitable; pursuing interstellar colonisation is the only way to secure permanent access to habitable environments. (13) Therefore, we are obligated to pursue interstellar colonisation. This is obviously a very long-term argument. The sun is not going to burn out anytime soon. But if it makes sense to think about our obligation to survive on billion-year timescales, the significance of solar burnout cannot be ignored. We will have to confront it sooner or later. There are, of course, some objections to that argument. An obvious one is that all the hope underlying it — that we will be able to access permanent habitable environments — is forlorn. Avoiding solar burnout is just a stop-gap measure. According to our best available theories, the universe itself will eventually burnout (experience a heat death) and become uninhabitable. We cannot outrun our destiny. Schwartz concedes this point, but argues that even if the universe is going to undergo a heat death it is not going to undergo one for a very long time. The sun will burnout in about 5 billion years, but this only represents 5 trillionths of the currently estimated habitable lifespan of the universe. So we can definitely hope for a much longer survival through interstellar colonisation than we can by hanging around on Earth. This is probably true, but I’m not sure how much moral (or persuasive) weight it should carry. I don’t think humans are well-equipped for moral reasoning on billion or trillion year timescales. Although the difference is huge mathematically, I suspect it all blurs into one when we start to think about it. At least, it does for me. Consequently, I’m not sure that the survival advantage highlighted by Schwartz is intelligible at the moment. Setting that aside, there is still another problem: that interstellar travel is (currently) technically impossible. This impossibility could be thought to undermine any moral obligation to pursue it since, if we follow Kant, ‘ought implies can’. In other words, if we can’t do it, we don’t have any obligation to do it. Again, Schwartz concedes the current technical impossibility of interstellar travel, but argues that it is not logically impossible, and so we may have a lesser obligation to at least pursue its technical possibility. So while we may not currently have an obligation to travel between the stars, we may have an obligation to try to make it possible in the future. Okay, that’s the end of Schwartz’s positive case for space exploration. I’ll look at the criticisms and replies the next day.